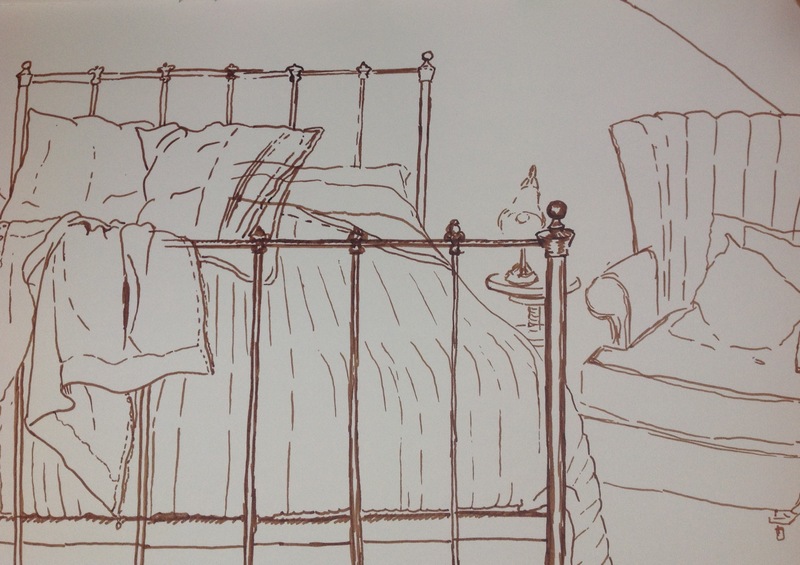 The curves of the bed frame and legs of the side table caused me the most trouble, but I like all the soft and curved lines of this scene. This time I sat on the floor against the opposite wall and this is as much as I could fit onto the page. I found myself caught up in the negative space around the wardrobe where dark things lurk! 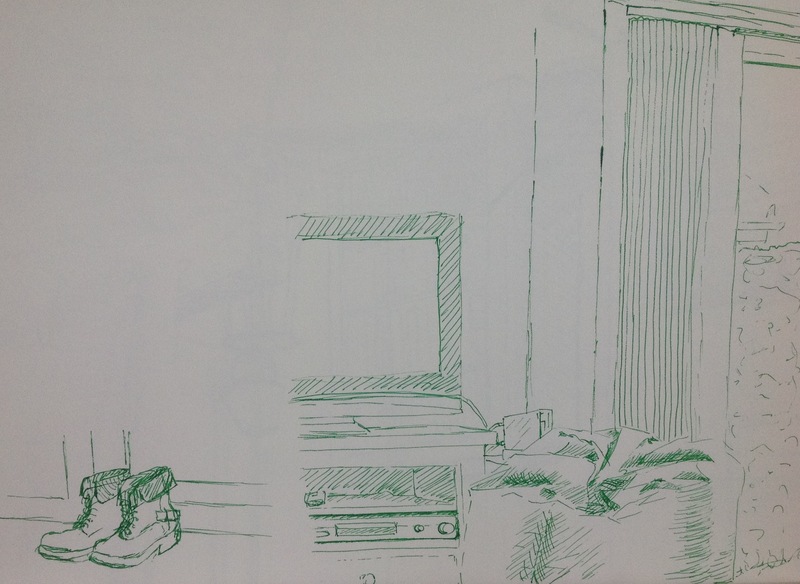 I had difficulty working out the perspective along the window sill. 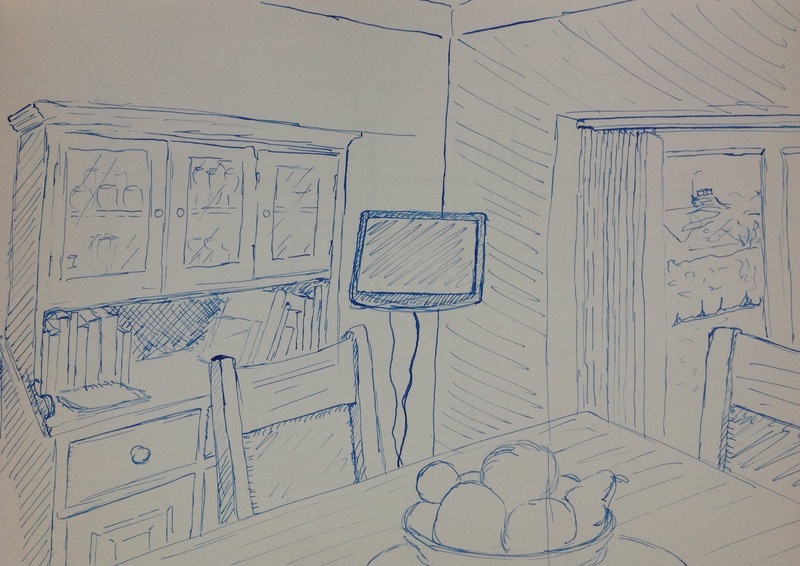 Again, I struggled with perspective as I was sitting on a chair but my eye-level was below the top of the bookcase. This time I sat on the floor. 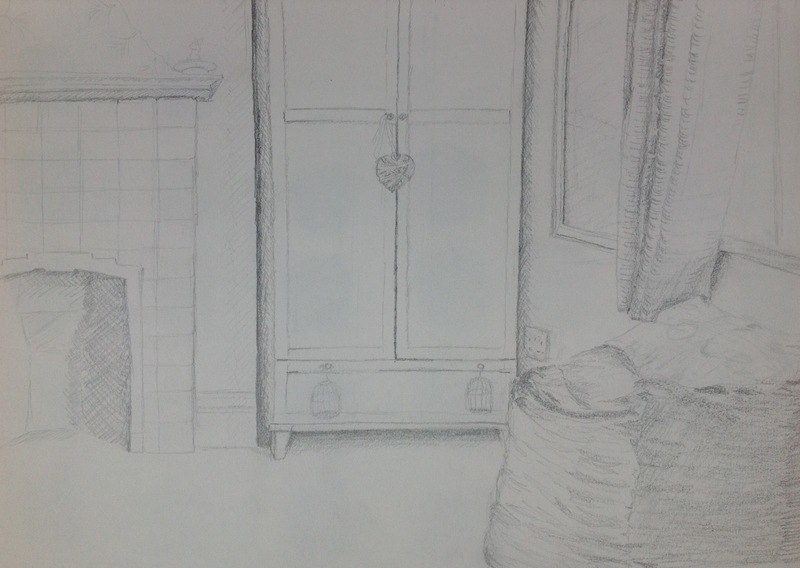 There are a lot of straight lines in my home and I got a bit bored with them so was glad of the bean bag and added a pair of boots which were further along and didn’t quite fit in the picture. This time I sat on a stool facing the bed. 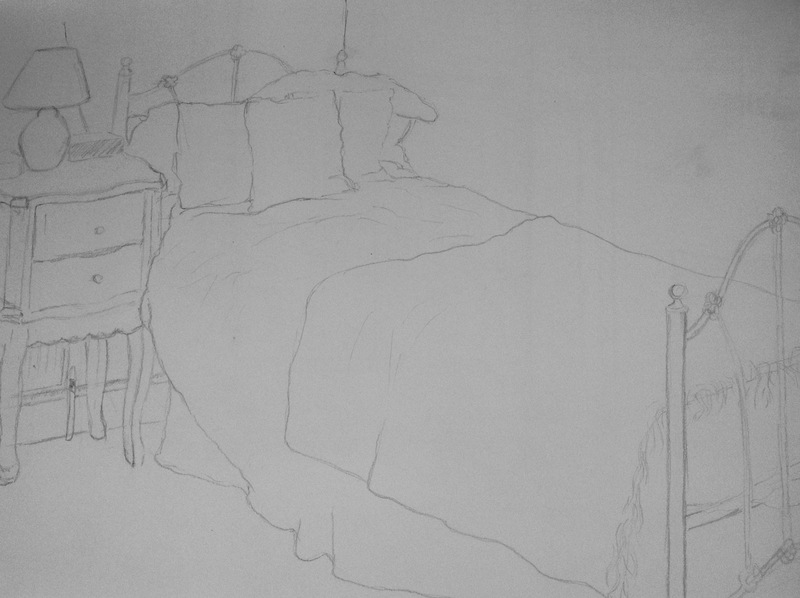 I really enjoyed working out the lines of perspective as the bed ‘grew ‘ towards me. This was a challenging room as the ceilings slope and the furniture positions are often at odd angles to fit into the space. This time I sat on the floor. I like the way the stool is close to the viewer and the interesting angles. Again I struggled with the perspective…need to do a bit more research on perspective. 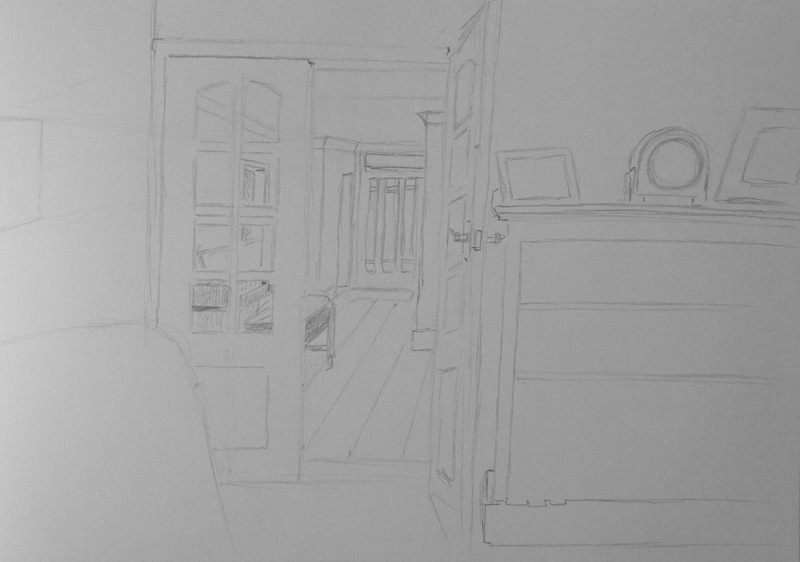 After researching one point perspective I found this drawing worked quite well. However, it is possible to get too caught up in technical drawing in a room with all these straight lines. A few curved shapes add a bit more interest into the composition. I tried a different angle of the dining room . 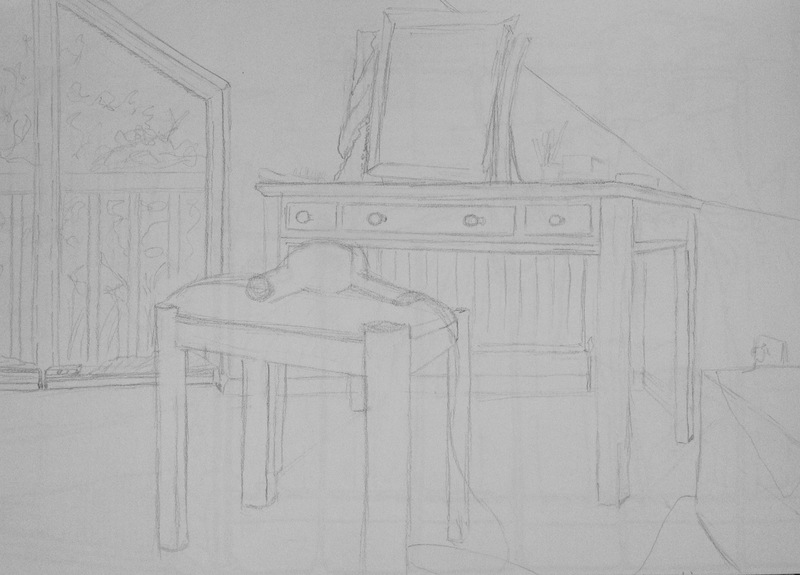 However I think I need two points of perspective for this drawing, so I didn’t get the angle of the dresser quite right. This composition has more interest with the fruit in the foreground and the view of the garden through the window. 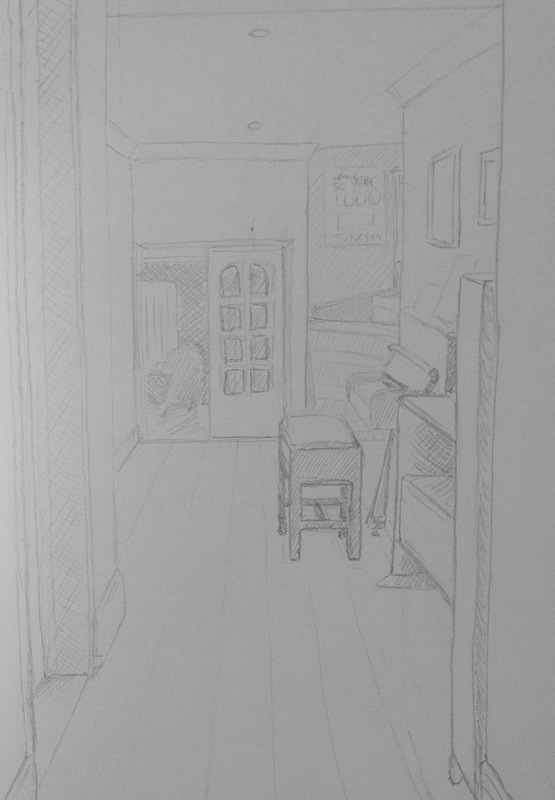 This composition attracts the viewer to what is outside the room whereas the sketch below is more about the hall space itself. I like the way the doors and staircase add interest to this composition. The kitchen, because it is the most accurate technically but also as a nice composition being framed by the doorway. Also the view of the hall from the front door as it is an interesting space with doors and rooms leading off and the staircase leading up. Potentially, the living room with bookcase and the dinning room with table as they both have an interesting mixture of shapes and angles with objects in the foreground and background. 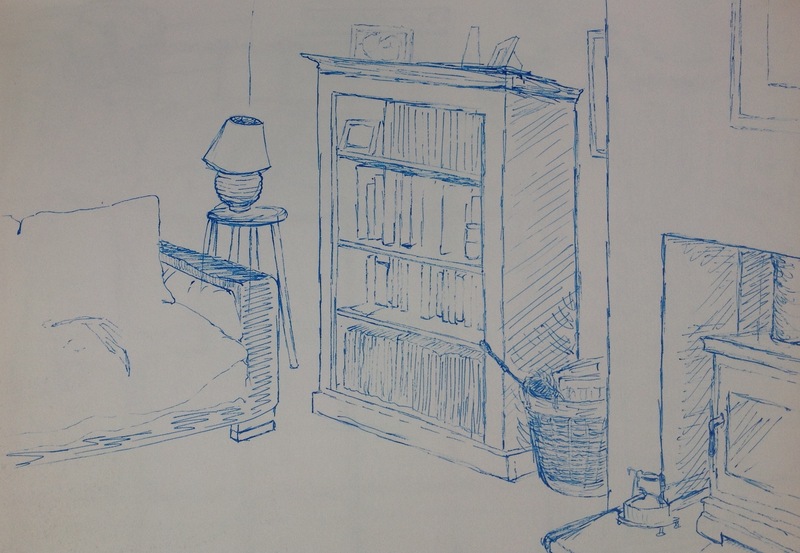 I found myself drawn to areas of negative space in several rooms where the shadows where at their darkest, so I think the bookcase in the lounge as I want to master the perspective but also examine the spaces surrounding the books. Or maybe the dinning room dresser for the same reasons. 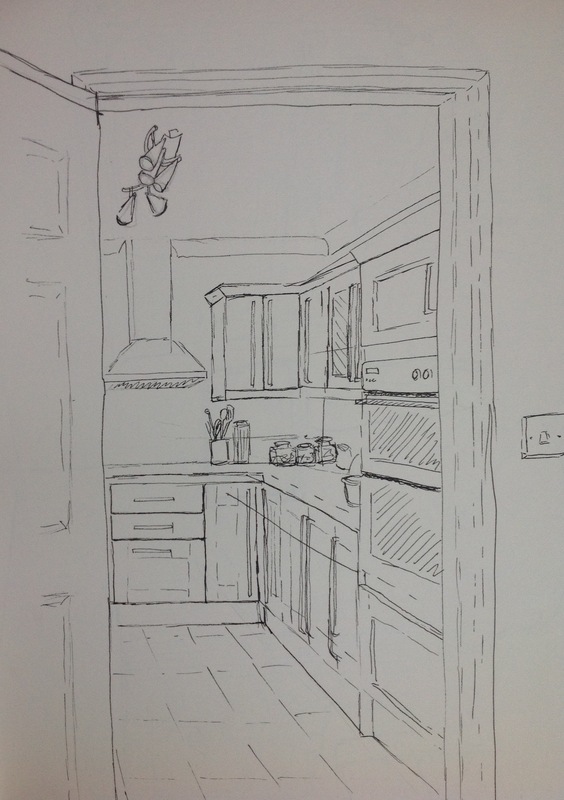 Previous Article Artists , interiors and perspective.